Fox Cities United Soccer Club is a youth soccer organization serving the entire Fox Valley, including New London, Hortonville, Greenville, Appleton, Grand Chute, Neenah, Menasha, Kimberly, Kaukauna, and Little Chute. Fox Cities United Soccer Club will comply with the following East Central Soccer District Weather Policy. In the event of pre-existing poor field conditions or weather, a designated club officer may determine that the game should be postponed. The designated club officer should notify the referees and the visiting team of this postponement. Either team may start the rescheduling process by submitting 3 options for new game dates and by following the East Central rescheduling guidelines. The referee will determine if a team will take the field or continue play if weather conditions deem it necessary to suspend the game. In instances when the referee suspends a game due to weather conditions, darkness, etc., a game will be considered complete if the first half has been completed prior to the game suspension. Once a game has been suspended and the first half or more of the game has been completed, the teams will not take the field again and the game will be recognized as a complete game. Scores will be recorded at the point the game was suspended. If the first half has not been completed, the game must be rescheduled and played in its entirety. If there is a game following the first suspended game the teams and referees should wait to see if they could get at least half of the game in. They should wait the 30 minutes from the last sound of thunder before taking the field. This policy is meant to save on rescheduling games. Once a game has been suspended due to thunder, teams must vacate the field and take shelter. 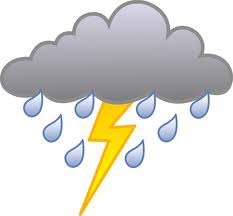 Referees and coaches should communicate the dangers of lightning and instruct players and spectators to take shelter. Order of authority: Referee, club official, coach and parents. If at any time, a parent thinks that it is unsafe to play a game when they hear thunder or see lighting they have a right to pull their child from the competition. See East Central Cancelation Policy procedures. If you hear thunder you must wait for 30 minutes before you start a game or restart a game that was in progress. When hearing thunder, assume there is lighting. Thunder is a better indication of when to stop a game because you can see lightning from a greater distance than what is necessary for game stoppage. Hearing thunder means there is lighting very close and it is unsafe to continue a game.